It was a chance trip to the Midwest on a cold winter day in December that took me within striking distance of the Strategic Air and Space Museum in Ashland, Nebraska. The museum had been on my list to visit if the opportunity ever afforded itself for me to be in the area. 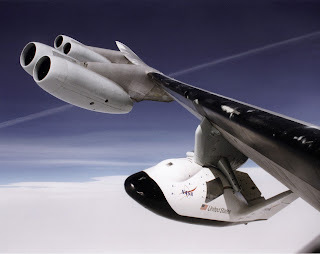 The reason for my interest was NASA’s X-38, also known as the CRV (Crew Return/Rescue Vehicle). 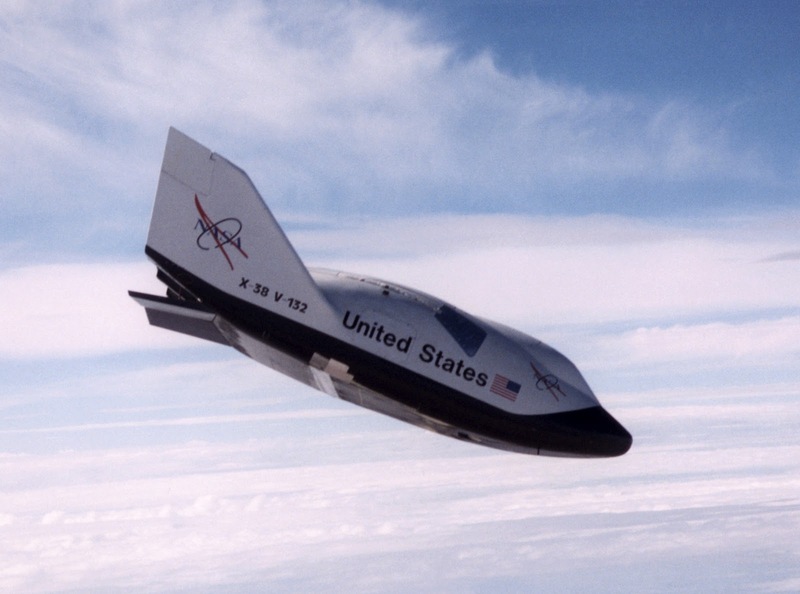 The X-38 was first proposed in the 1990’s and was to be NASA's first new manned spacecraft since the Shuttle. The craft was given to the museum on permanent loan to display alongside its primarily military aircraft. I had inquired over the years as to the whereabouts of the vehicles. Three had been built for testing within Earth’s atmosphere; a fourth test vehicle would have been rated for testing in space, but it was never completed. The tale of visiting the museum and seeing the X-38 has an element of disappointment much like the feeling I get when I ponder what is to become of America’s once mighty space program. I was interested in photographing the vehicle up close and writing about its history and its fate. When I originally made my request, my information indicated that the vehicle was stored at NASA’s Dryden facility in California. Initial conversations seemed promising that I might actually be granted access to the vehicle until it was determined that the vehicle was not at Dryden, but had been shipped to the Johnson Space Center in Houston. Another round of inquiries and I was told that the craft was in an off limits building. I was pleasantly surprised when I read an article that the craft had been given to a museum to display and would finally be made accessible to the public. This particular vehicle was not a full-size mockup, but purely a test vehicle at roughly about 80% the actual size of the final vehicle. It was in many ways like was the first Space Shuttle Enterprise, an earthbound trailblazer whose descendants would lead a path to the stars. When I arrived at the museum, the lot was nearly empty; only a school bus and one other car were in the visitor parking lot. This was no surprise; I was here on a Tuesday in December, and it was already mid-afternoon with a crisp chill in the air and grey skies above. However, this was a rare opportunity to see a planned spacecraft and a piece of space history. It would not take long for me to find that I had overestimated the significance and importance of this particular artifact to the museum. Upon paying my $12 dollar fee, I was handed a map of the complex. I didn’t bother to look at it. I was here for only one reason. The rest of the displays, while interesting, were not why I had travelled halfway across the country. After walking downstairs into the main display area, I realized that the object of my search was likely mingled among bombers, jets and cars. Yes, cars were displayed under the wings of many of the military planes. The purist in me cringed at obscuring the beauty of an aircraft by parking a line of Corvettes and other assorted vehicles underneath its wings. My time was short and I moved briskly through the cavernous, hangar-like space; I thought to myself that surely this item would be somewhere visible and prominent, but it was not. It appeared to not be here at all. Finally, I resorted to the map I was given. It was also not listed on the map. It crossed my mind that maybe the craft was not on display, but being restored or prepped for display. By pure luck, I had wandered to another section of the museum and down a hallway where I caught a glimpse of an oddly placed Star Wars exhibit. As I moved closer to the exhibit, I saw that it led to another smaller display area of the museum. From that hallway, I could see some version of an Apollo test capsule and a Space Shuttle tire. As I walked into this section I turned and there is was, the X-38. There was an instant emotional letdown that is hard to articulate. I was shocked at what my eyes were seeing. It was tucked in a corner and sitting on what resembled a boat trailer. Where it was and how it was displayed spoke volumes. It was parked as an afterthought, a leftover that needed a home and this was the best that could be done. Absent were any decals or logos and it appeared to be in less than pristine condition. It was dirty and scratched, the vehicle was not protected and no signs were present to tell patrons not to climb or touch the vehicle. Judging from its appearance, it looked as if many visitors had climbed all over the craft. I spent about a half hour photographing it from every angle and studying its shape and lines. What a magnificent spacecraft this would have been I thought. As I looked more closely, I noticed that someone had etched their initials into its side. It was a sad ending indeed for what could have been, but was not to be. The spacecraft would have been more at home at the National Air and Space Museum in D.C. or parked alongside a future display of the Space Shuttle. This was no fitting end for a remnant of the space program that had cost the taxpayers $500 million. The X-38 had been of particular interest to me since it was first proposed. I saw its development as advancement in human spaceflight. The CRV would not be the vehicle that would take us back to the moon or Mars, but it was a chance to develop a less costly crew only vehicle while leveraging the Shuttle for more complex delivery missions. In theory, the vehicle would be simpler and safer than the Shuttle and provide the U.S. space program with some much needed versatility. It would also leverage knowledge gained from the Shuttle and advancements in technology since the Shuttle was created. The sleek look of the X-38 was familiar; it had a lifting body design reminiscent from the 1960’s, but incorporated new materials and composites. Eventually, the space rated version of the X-38 would carry an advanced Thermal Protection System (TPS) to shield its crew from the heat of reentry. It would be the reusable ferry to deliver crew when the lift capabilities of the Shuttle were not required. In its first role, the X-38 would serve as a lifeboat for the International Space Station and be carried there in the cargo bay of the Space Shuttle. A key design requirement, and constraint, was that it must fit in the cargo bay of the Shuttle. The CRV was a critical component of the ISS. Without it, the station could not be fully staffed and could only be manned by a crew of three without a Shuttle present. A station crew of three was sufficient to keep the orbiting outpost operating, but insufficient to maintain and conduct the scientific research and experiments that were its primary function. Each day on the ISS without a CRV meant that the reason for building the largest man-made complex in space would not be fulfilled. The station was too expensive to let its potential wither because planning, politics, and funding would once again converge to scuttle humankind’s potential uses of space. After development, testing and utilization, subsequent plans for the X-38 would call for modification of the initial design so that the craft could evolve to become a new low cost crew transport carried atop an existing Delta, Atlas or Ariane rocket. The Air Force’s X-37b, which is a crewless mini-shuttle that in many ways resembles the X-38, is a vehicle that remains in orbit to conduct research and perform experiments. It was envisioned that a variant of the X-38 could also be launched pilotless to conduct experiments providing another capability that did not exist with any of the current platforms. Its capabilities seemed to be broadening not only how we could get to space, but how we could leverage one design for a multitude of tasks. Such were the dreams of engineers and program managers who saw in the X-38 another way to expand our reach into space. The X-38 would never make it to space and like the forthcoming retirement of the Space Shuttle, it would be relegated to becoming an expensive museum artifact. The program was cancelled by President George W. Bush and its demise supported by then NASA Administrator Sean O'Keefe. I had a spirited exchange with then Administrator O’Keefe about the merits of keeping the X-38 program alive at least until an in-flight drop test from the cargo bay of the Shuttle could prove its viability. The discussion was futile, this was not about what was needed, the future, what was right, wrong, or what should be done - this was about how many dollars could be saved at that moment. It is the epitome of being pennywise and pound foolish. Original costs were projected at $700mm, but costs ballooned to over a billion. Competing ideas for a CRV capsule version had put development at $2 billion, but by those numbers the X-38 still seemed a bargain even with higher than anticipated costs. The program’s end came after an expenditure of $500 million with a projected $500 million more needed to operationalize the program, $200 million of which would have completed the flight testing. The result would be costly; the ISS was dependent on the X-38 program to allow for the station to be fully manned. The station would operate a large portion of its existence undermanned due to a lack of rescue capability. Much potential science would be lost over the years because the CRV would never fly. What-if’s are often not fair to use, especially in hindsight, but a spaceflight ready CRV that required testing would have needed a Shuttle to fly it. The logical choice would have been Space Shuttle Columbia. The aging Columbia was in search of a mission when it was tragically struck by debris and subsequently lost. Many things went wrong with Columbia, but a CRV in the cargo bay and a detection of the breach in the leading edge of the left wing might have offered the astronauts their only hope. There are a lot of unfair assumptions in that scenario, such as transferring to the vehicle, wearing full pressure suits in the cramped compartment of the CRV, the pressurization of the crew compartment, and so many others. Much has been written about other ways to rescue Columbia, but the thought had occurred to me that this could have been the mission to test the X-38. It would have been an irony of sorts that the CRV on its maiden flight might have been called to duty and not been able to serve. It was our ability to paint an exciting vision that gave us the X-38 and our lack of will that clouded our dreams and left it grounded. The recent release of NASA's budget reveals the struggles the agency faces in trying to recapture its early glory in sending humans to destinations in the heavens. The news is mixed for America's future in space. The Space Shuttle will soon become another museum artifact, the Constellation program and a return to the Moon or Mars seems as difficult to reach as the Red Planet itself. We have gotten here because we had success early in space, success that strained the very limits of our financial and technical capabilities and fatigued our ability to run a sustained journey to the stars. Shifting political winds are often credited or perhaps more rightly blamed for the fate that has befallen the American space program. This post-Apollo tightening of NASA's financial resources led to a series of weak administrators who sought to carry out the orders of each President and work within the budget authorized by Congress. Playing in this tug-of-war forced NASA to develop a less that optimal vision for space. In an attempt to win this contest, NASA often underestimated the cost and over estimated performance. This created another set of problems where increased costs either used up scarce resources destined for development of future platforms or caught the ire of politicians who continually retooled NASA’s missions - enter the X-38. It became another program that came into the budget crosshairs as costs escalated. In the insanity of our process, we often first choose to throw away our investment rather than finish the investment and reap the return. On this day, I was interested in seeing not only where my tax dollars had gone, but where the American spirit and our dreams of reaching for the stars had ended. Museums are places where we go to view the best works of mankind and not where we bear testament to the failure of our imagination and our dreams. The X-38 sits collecting dust and serving as an amusement for school kids to climb and perhaps dream that they are riding its back into space. In that role, and at least in the young minds of a few school kids, the X-38 made it into space after all.